Looking at the numbers, young Americans aren’t so eager to get married. But a new survey might give those couples living in Boston a little encouragement. Thumbtack, an online marketplace for professional services, on Monday released its rankings of the 25 priciest metropolitan areas for tying the knot. Located square in the middle at No. 12 is Boston. “Our study is the first to publish average pricing from hundreds of thousands of real wedding prices quoted to couples,” wrote Thumbtack’s wedding director, Ashley Brasier, in an e-mail. The site compiled the rankings by combing through all those listings to gauge the average price for, say, a custom cake or a wedding singer in cities across the US. According to Thumbtack’s data, the average total for “essential wedding services” nationwide is around $12,189, up 20 percent from last year. Those services exclude expenses such as the venue, dress, and rings, and that average is in line with what a couple might pay in Milwaukee ($12,197 got the city a ranking of No. 16 on the list). For the same services, Bostonians will shell out an average of $13,028, according to the survey. 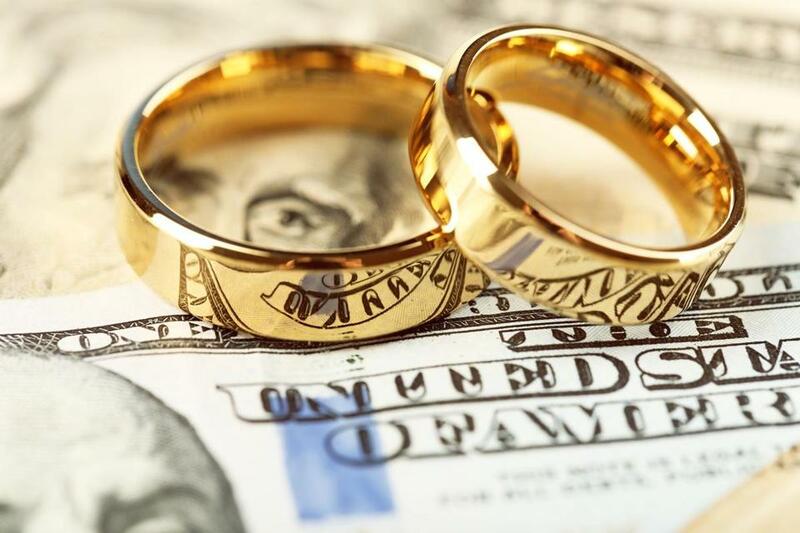 A detailed financial breakdown reveals a few insights into how Bostonians approach their nuptials. For example, Boston couples tend to spend less on cake ($197, the smallest expense) than on hair and makeup ($234 and $210). 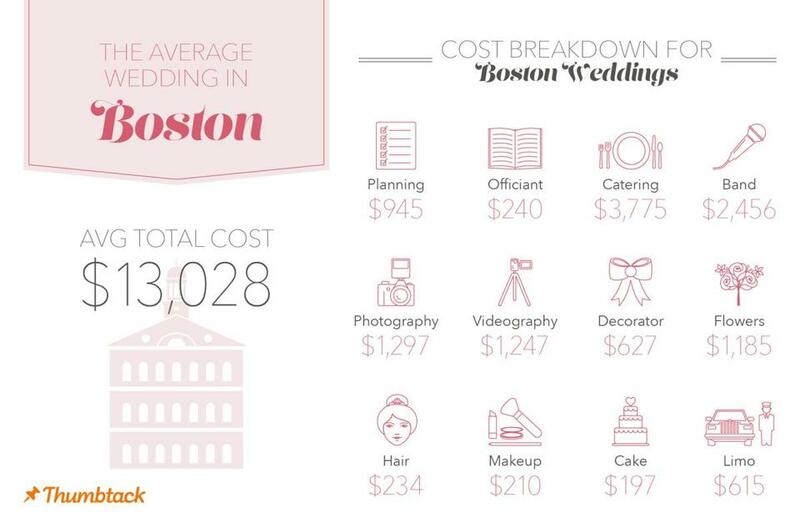 And curiously, wedding decorations and flowers cost, on average, less in Boston ($1,812) than they do in cities that are comparatively less expensive overall, like Miami, Los Angeles, and Chicago. “Perhaps Bostonians are more sentimental than couples elsewhere, investing more in extras like video highlight reels and custom albums,” Brasier wagered. In New England at large, though, one might consider such prices affordable. Providence, for example, came in at No. 5 on the list, with an average price of $13,990 for essential wedding services. There, decorations and flowers run about $2,166, photo and video average about $2,616 each, and live music costs about $2,837. Providence is also home to the most expensive DJs on the list, averaging $780. If nothing else, betrothed Bostonians can (once again) take solace in the knowledge that they don’t live in No. 1 ranked New York, where an average $16,077 bill includes a $5,162 catering bill. Rounding out the top 5 were Philadelphia at No. 2 ($15,434), Pittsburgh at No. 3 ($14,287), Baltimore at No. 4 ($14,261), and Providence. Joe Incollingo can be reached at joe.incollingo@globe.com. Follow him on Twitter @jk_inco.